My kids at least learnt french from primary school and found it easier. It would be very interesting to have half the day in one language then have to switch to another. Mine was similar. I learnt French from 11-16 which ... well, it wasn't a total disaster since I did learn some, but I really only got the basics and I found it pretty hard. 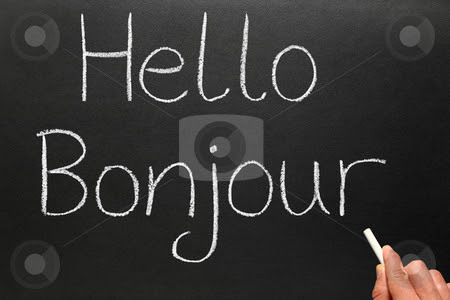 I often feel quite embarrassed when I meet people from elsewhere in Europe who speak multiple languages fluently. Still, attempt #2 with the Japanese!! It's interesting to read how other countries are trying to cope with multiple languages. South Africa has eleven official languages. That's a Gordian knot that's further aggravated by politics, poverty in rural areas and different educational standards in different racial groups. Anyway. Thanks for a good read! How does it work in South Africa? Is there a language all schools operate in or does it depend entirely on the school and area in which it is in? Is there one language which most people speak? In India, I was told you can pretty much get around speaking Hindi (at least in theory) although there are a gazillion languages spoken by the population. All kids in public primary schools have (or may/should have) all classes in their mother tongue. However, English dominates in public high schools, and you have to pass English in your final school exam if you want to go to university. Real-life ability remains limited, especially in rural areas, but you can communicate in English in most areas. Wow. So in the big cities, there must be primary schools operating in parallel in different languages? Or is it that language use is sufficiently regionalised that one town really only has to offer one or two languages? Glad you liked the marriage post! Kids are surprisingly amusing... after the fact, anyway. Yes to both questions. There are many parallel schools, and language use is quite regionalised. I attended a parallel medium (Afrikaans and English) primary and secondary school, but I took both languages as a FIRST language. That's allowed in certain cases. I find that both confusing and awesome at the same time. What does it mean to take both languages as a first language? Does that mean you have classes in both? Like a mixed set, some in one and some in the other? Um. If you get bored of answering all these questions, I won't be remotely put out. ... it just means Sarah will get them all later when I return to Sapporo! Oh, but you should ask Sarah anyway, because she belongs to a younger generation and completed her school years in the so-called new post-apartheid South Africa. I wrote my final school exam long before 1994 (when SA got a black government). I went to a white school, which meant only Afrikaans and English were taught as first and/or second language, and only European languages (German, French, Latin) were available as a third language. No black languages were taught in white schools.